Any questions about whether Nike might quickly back away from its decision to embrace the polarizing quarterback Colin Kaepernick amid threats of a boycott and criticism from President Donald Trump dissipated Wednesday when the company released a two-minute advertisement narrated by him and announced plans to have it run during the NFL’s first telecast of the regular season. The ad, called “Dream Crazy,” features Kaepernick and other star athletes in the Nike stable, including Serena Williams and LeBron James. It implores viewers to dream big, using the inspiring stories of those stars and of everyday weekend warriors who overcame illness or disability to triumph athletically. “Believe in something, even if it means sacrificing everything,” Kaepernick says over images of him watching a waving American flag projected against a building. 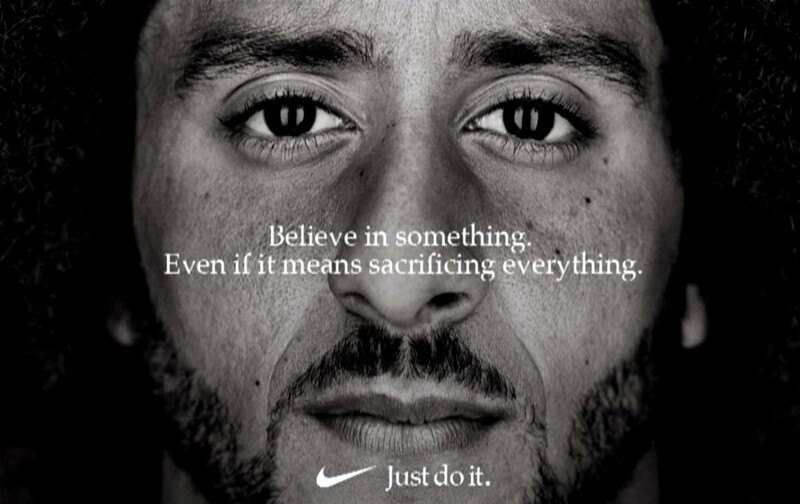 Those words appeared in an ad that was released Monday announcing Nike’s new partnership with Kaepernick and on a billboard of him that went up in San Francisco on Tuesday. “Nike’s ‘Dream Crazy’ campaign will air this week during sporting events such as the U.S. Open, MLB and college football in addition to ‘Thursday Night Football,’ ” said Nike spokesman Josh Benedek. Greg Hughes, a spokesman for NBC Sports, confirmed that Nike had purchased airtime on Thursday’s NFL game. The league did not immediately respond to a request for comment. Nike is a major partner of the NFL’s, providing the uniforms for all 32 teams and the clothing worn by everybody on an NFL sideline. In 2016, while playing for the San Francisco 49ers, Kaepernick began kneeling during the national anthem to protest racism and other social injustices. Other NFL players, as well as a few athletes in other sports, followed his lead. After initially being silent about the Nike campaign, Trump, who has hammered the NFL repeatedly for not barring players who do not stand for the national anthem, took to Twitter to criticize the company. “Just like the NFL, whose ratings have gone WAY DOWN, Nike is getting absolutely killed with anger and boycotts. I wonder if they had any idea that it would be this way?” Trump tweeted Wednesday morning.